We’re here! Actually, we’ve been here since yesterday around 3pm. And truthfully, we should have been here Saturday night, but that’s a long story. We took off from Oklahoma early Friday morning and I was so excited to finally hit the Texas line. Route 66 meets 40 just west of Oklahoma City, but the crazy touristy Route 66 stuff really starts in Texas. We saw all sorts of crazy things through that short stretch in the panhandle and were quickly crossing the New Mexico state line. Texas changed from plains to desert pretty quickly after Amarillo and New Mexico looked pretty much the same all the way across. But anyone who has never been in the American Southwest might be surprised at just how many different types of desert there really are. Texas and New Mexico change it up from area to area, but Arizona and California deserts seem to be the most diverse. The scenery can change from flat, brushy desert to red clay and pines in less than half an hour, followed by rolling hills spotted with cacti, then to sandy dunes, then to mountains of boulders. There are even random desert towns that seem to be dedicated to growing palm trees and other lush, green crops in the middle of all of the dust. Who would imagine how many different terrains can be seen within a six hour stretch? 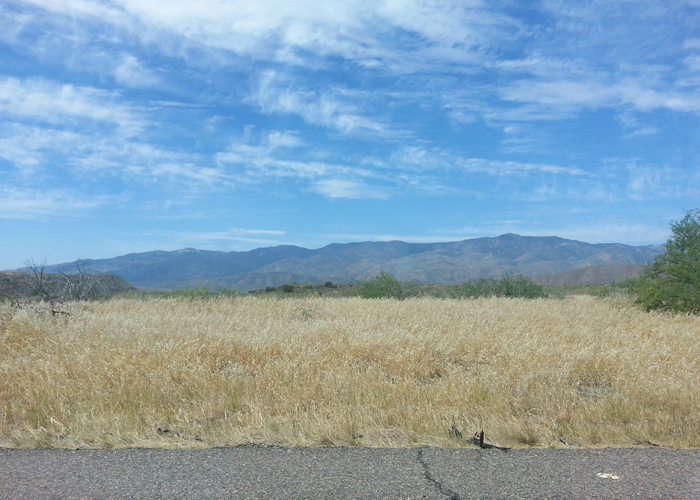 Arizona remains my pick for most gorgeous state in the US. Although, our experience with Arizona this time around was far less than satisfactory. It started wonderfully; I “stood on the corner” in Winslow, where we had spent the previous night, we visited a meteor crater outside of town, and we hopped off the highway for a slow drive through the gorgeous town of Sedona (America’s most beautiful place, in my opinion) before heading back towards I-17 South to get on our way to Cali. We were making great time; I even emailed Dan’s grandma and told her we’d make it that night. After all, we were only six hours from San Diego. And then we popped over a hill to find that the next mile of traffic we could see ahead of us was at a standstill. We sat there for two hours before our inching forward put us over the next hill, where the next half-mile of traffic was disappearing behind a hill and not coming out on the other side. Twitter #hashtags told us that a fatal accident had killed two people earlier that morning and that everyone was being turned around and sent back north. Our only option was to head 90 miles back to the 40 and go over to LA and then down; this would have added 2.5 hours to our trip. And I hated to complain about such a silly thing when people had died, but I was starting to feel sick and we were losing time. Half an hour north of the accident we found out the interstate had reopened so we turned back around and followed the slow mass of traffic the last 60 miles to Phoenix. By then I was breaking into a fever and starting to feel miserable. We stopped and got a hotel and I was in bed shivering by 7pm. I did not have a fun night. The idea of getting in a car Saturday morning literally brought me to tears. I felt awful and I was so far from home, so I had a mini panic attack and my first bout of homesickness right there at 6am in a hotel in middle of nowhere Arizona. By the time we finally made it here, after a gorgeous drive by the way, I was feeling much better. I’m still not in great shape, coughing all over everything and downing my new antibiotics in bed all day, but we’re here and I’m relieved about that. I sure hope I get to feeling better soon because we’re heading north to Orange County tomorrow and we’ll start our apartment hunting on Wednesday. I have so many photos from out trip. I promise to share more when I’m able to sort them out!